Vizsla is a hunting dog developed in Hungary and it is therefore often referred to as the Hungarian Vizsla dog. The name is Hungarian is pronounced VEEZH-la (zh as in vision). Sometimes the Vizsla name is left out and the breed is referred to simply as the Hungarian Pointing Dog. This breed is naturally short-haired, but during the 1930s a wirehaired Vizsla was created by crossbreeding Vizsla with the German Wirehaired Pointer. In this article, you will find a lot of of interesting Vizsla dog information. Did you for instance know that Vizslas are not only great pointers, but excellent retrievers as well? The Hungarian Vizsla dog is therefore popular among hunters that want a versatile breed capable of carrying out several tasks during hunts. Even if you get a shorthaired Vizsla dog, you should expect it to shed quite a bit. Keeping the short-haired coat in prime condition is easy; you only have to brush it with a firm bristle brush once in a while. Only bath when necessary and use mild shampoo. Nails must be trimmed on a regular basis. Baths should be limited to 1-3 times per year. Giving your Vizsla dog enough attention is an imperative part of good Vizsla dog care, and this breed requires plenty of mental and physical exercise to stay healthy and happy. Without proper stimulation, Vizslas can become hyperactive and find destructive outlets for their energy. They can even harm themselves by persistent licking. The Hungarian Vizsla dog has no undercoat and must therefore be protected from cold. Taking a walk during a cold day is no problem, but Vizslas should never live in outdoor kennels since this is too cold for them (unless of course the kennel is located in the tropics). The Vizsla dog puppy is a charming little fellow, but before you decide to bring it home you should ask yourself if you are willing and able to care for a dog for the coming 12-15 years, which is the average lifespan for this breed. You should also determine if the Viszla is the perfect breed for you, or if some other breed would suit you even better. The Hungarian Vizsla dog needs plenty of mental and physical stimulation and getting a Vizsla dog puppy is only a good idea if you are an active outdoor person that wants to bring your dog along. If you get a Vizsla dog puppy, you should also be prepared on plenty of shedding. The Hungarian Vizsla dog responds more willingly to obedience training than most other pointer breeds and is known to do well in obedience contests. 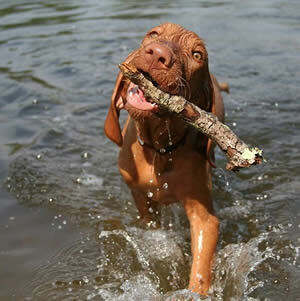 With the right type of Vizsla dog training, you can get a dog that is excellent at pointing as well as retrieving. Vizsla dog training should always be gentle, because the responsive Vizsla dog needs no harsh commands or corrections. Harsh training can make them unhappy and insecure. It should be noted that the Viszla dog have a mind of its own and they are easily distracted by sights, sounds and scents. Consistent training is therefore a must. Early socialization is another important aspect of Vizsla dog training, since improperly socialized Vizslas can become shy and scared. The origin of Vizsla dog breeding can be traced back to the 9th century when the Magyar tribes of the Carpathian Basin started to breed dogs for boar hunting. These dogs are the ancestors of today's Vizslas. The first written reference to Vizsla dog breeding is found in the Illustrated Vienna Chronicle, a piece written by Carmelite Friars in 1375. During the 19th century, Viszla dog breeding declined due to the increased popularity of pointers from England and Germany. The Hungarian Vizsla dog is fortunately not a very popular breed for puppy mills, and most Vizsla dog breeders are responsible ones that strive to promote good health in the breed. As the popularity of this breed is on the increase, we might however see an increase in irresponsible breeding as well. When purchasing Vizslas, it is very important to stick to serious Vizsla dog breeders. Examples of health problems associated with the breed are hip dysplasia, hypothyroidism, dysphagia-megaoesophagus, ectropion, and entropion. The Vizsla dog price varies a lot and when you compare the price offered by different breeders it is important to investigate what you actually get for your money. If you want to use your dog for both hunting and show it can for instance be a good idea to purchase only from breeders who produce dual-purpose (both show and field) or even triple-purpose (show, field, and obedience) Viszla dogs. All prospective owners should also investigate if the Vizsla puppies has been vet-checked, vaccinated and de-wormed.